Repost! Original article was lost in a WordPress software upgrade. The Met. Dept. told us southern Thailand residents to brace for a storm. So I placed my feet well apart, folded my arms, adopted a stern King Canute face, and ordered the waves not to come any closer. Just like the King of yore, they ignored me. That was four days ago, and the last two have been kind of wild. The northeast monsoon should have ended by now, but it seems El Niño has other ideas. Skies have been black, the wind gale force, the rain torrential, and the waves high. How high? Well, in the last major storm, at high tide, they were hitting the sea wall and shooting spray a couple of meters into the air. In the first morning of this storm, they were doing that at 10am, and high tide isn’t until lunchtime. Looks ominous, I thought. By the time high tide rolled around, the waves were shooting a good five or six meters into the air. A little ways down the road, where there is no sea wall, the waves were washing across the road. “Where are the photographs?” you ask. Seriously; there was no way I was going outside in that weather. The rain was horizontal, mixed-in with the sea spray. The sea churned-up the sand so much it turned coffee color, and with the spray on top, it looked like angry cappuccino. Much like your cup looks when you slam it down on the table, after realizing Starbucks has mis-spelled your name, yet again. The second day of the storm was more of the same. Now, it’s dull and wet, the sea is still angry, but the wind has dropped. Which is good news, because if it had strengthened, I would have needed to find some way to raise the furniture. Dragging it up the stairs would have been impossible. I suspect I would have sacrificed the dining table and loaded everything on top. Luckily, I didn’t need to. But others were not so lucky. There has been extensive flooding both north and south of here, including on Koh Samui. 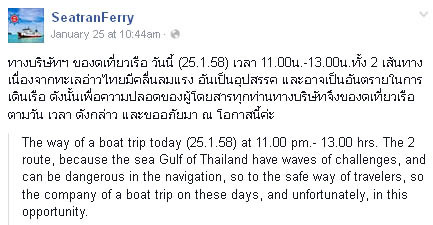 Ferry services were halted for two days, no doubt stranding hundreds of tourists. For me, the worst part was the frequent and long power outages. Understandable, I suppose. Connections in overhead cables must be easily broken. Outages are not unusual anyways, and I can normally find something to do that doesn’t require power. But the skies were so black that even at midday it was almost completely dark indoors. And there’s not much you can do in those circumstances. Thank goodness for iPads. They still worked – for a while. I even needed a flashlight to make some lunchtime tuna sandwiches. Yes folks, I can tune a guitar, and I can tuna sandwich! But I’m glad I used the flashlight, as, in the damp weather, the bread had gone moldy! Keeping very still was a good idea as it kept walking without biting me. I’m told the sting hurts like hell for at least a week, and then moderates to really painful for a few more weeks. But luckily it’s rarely fatal. I had to feel sorry for one guy I read about a few years ago. He had one crawl up the inside of his PJs while he was fast asleep, and you can probably tell where I’m going with this, yes, it bit his … well, you’ve figured it.